Twenty seconds into the video — watching this tall, lanky kid create separation with a jab step before displaying near perfect form on a long distance 3-pointer — I was captivated. Here was a 7-footer who had handles, deep range and court awareness. He broke ankles, protected the rim and finished layups at difficult angles with ease. Some of those highlights were against smaller and inferior players, others against some of the most talented players in his class. 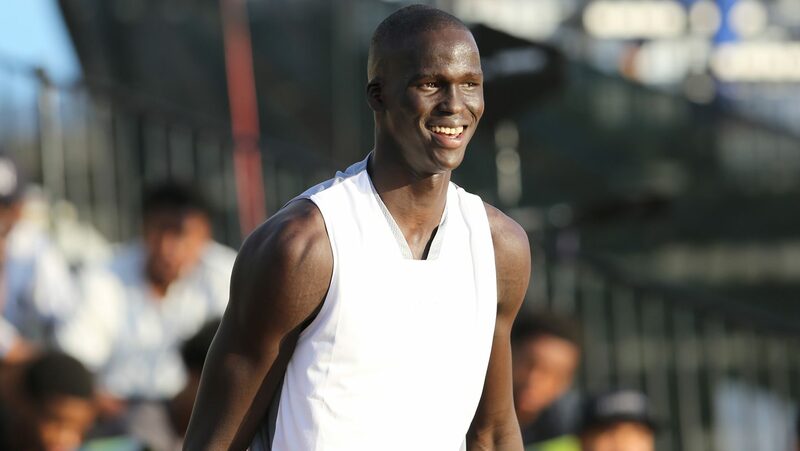 With his height and range, Thon Maker looked like a Kevin Durant clone. Watching the video and thinking about the growth that would come with two more years of high school and a year of college, it was easy to envision Maker as an NBA lottery pick. Yet when the NBA holds its annual draft today, Maker, 19, is its biggest mystery. By spending a postgraduate year at a Canadian high school, Maker found a loophole into this year’s draft. By skipping college, he was also able to avoid competing in a competitive college arena that could have developed — or exposed — his talent. That’s why the draft analysts can’t figure him out: ESPN.com’s Chad Ford predicts Maker will be taken by the Denver Nuggets with the 19th pick. NBA.com has him going to the Boston Celtics with the 23rd pick. NBADraft. Net.com has the Raptors picking him at 27, and DraftExpress.com has Maker being snubbed in the first round. Two years after that impressive mixtape was released, it appears clear that Thon Maker is no Kevin Durant. What isn’t clear: whether he’s good enough to become an impact player in the NBA. Players who have made early reputations on YouTube have mixed histories. Some are successful. DeMar DeRozan (Toronto Raptors), Brandon Jennings (Orlando Magic) and John Wall (Washington Wizards) have been introduced on the platform through popular sites such as Hoopmixtape (403 million combined views on its main and affiliated channels since being launched in 2006) and Ballislife (604 million views on its channels). The top three videos for Hoopmixtape: Seventh Woods (14 million views), John Wall (8.6 million views) and Aquille Carr (8 million views). Woods was a 14-year-old at the Hammond School (South Carolina) when his mixtape was released in 2013. A 6-foot-2 combo guard, Woods will play at North Carolina in the fall. Wall, the nation’s top-ranked player at Word of God Christian Academy (North Carolina) when his mixtape surfaced in 2009, is now with the Washington Wizards and one of the top guards in the NBA. 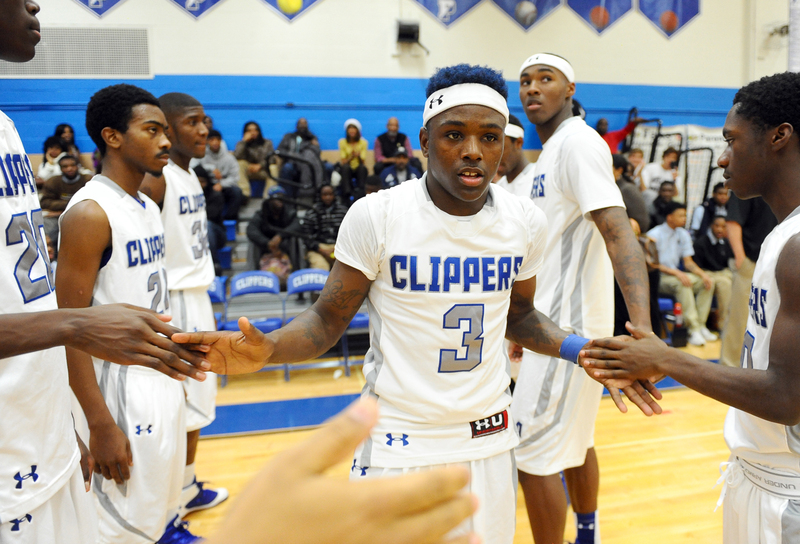 Patterson High School basketball phenom Aquille Carr (3) runs onto the court during player introductions as they take on Baltimore City College High on Dec. 19, 2011 in Baltimore. His YouTube videos made him an international star, and he was featured on the cover of Dime Magazine and profiled by GQ and CNN. But he never played a minute of college ball. Academic problems and a 2012 arrest scared off schools. Since leaving high school, Carr has played in the NBA Developmental League and the National Basketball League of Canada. He was released by both teams he played on. There will be no such sad story with Maker. When he’s drafted today, it will be a significant step toward his longtime dream of playing in the NBA. His life could have easily taken a different path. Born in South Sudan, Maker was 6 when his family escaped the civil war and fled to Uganda, where they stayed briefly before entering Australia as refugees. Team EZ Pass’ Thon Maker (No. 21) in action against Team Doo Be Doo in the Under Armour Elite 24 game on Aug. 22, 2015, in Brooklyn, New York. Maker was 12 when he met Ed Smith, a basketball coach who was born in Liberia and migrated with his family to the United States before eventually settling in Australia with the goal of creating a pipeline for players to enter colleges in the United States. The first time Smith saw Maker, a skinny 140-pounder who stood 6-foot-9, he took him to the court to check out his talent. Smith approached Maker’s parents about coaching him. The goal: to get Maker a scholarship to attend a high school in the United States, where he would be able to develop in an environment that stressed academics and sports. There was a stipulation. Smith requested guardianship, and requested that Maker live with Smith’s family. The family, initially reluctant, eventually agreed to Smith’s terms. A recent ESPN.com story explored questions about Smith efforts to get other talented young players into Division I schools. Smith and his family moved to the United States to pursue basketball opportunities for Maker. One of the first stops was Houston, where Maker, 14, made an appearance at the John Lucas basketball camp for middle school players. After a dominant performance there, Maker was named the No. 1 eighth-grader in the country. With Maker’s credentials established, it was time to find a school. He was recruited by Sierra Canyon, an athletic powerhouse in California, which also offered Smith the job as head coach. Instead, Maker enrolled at Metairie Park Country Day School in New Orleans, where he played during the eighth grade before withdrawing from school three games into his freshman year. That began a stretch of constant movement: He played two years at the Carlisle School in Axton, Virginia, where he ended the 2013-14 season as ESPN’s No. 1 player. He fell out of the rankings the next year when he transferred to Orangeville Prep in Ontario, Canada, to play with the affiliated Athlete Institute, a basketball academy where Smith had taken a job as an assistant coach. Why the move to Canada at a time when Maker’s career was taking off? The move to Athlete Institute was, for Maker, initially humbling. Used to being the best player on the floor, Maker, playing alongside Jamal Murray, wasn’t the best player on his team. The struggles continued the following weekend in the Biosteel Canadian All-Star game. Murray was again the MVP (29 points, eight rebounds, 10 assists), while Maker missed 11 of his 13 shots and finished with eight points. 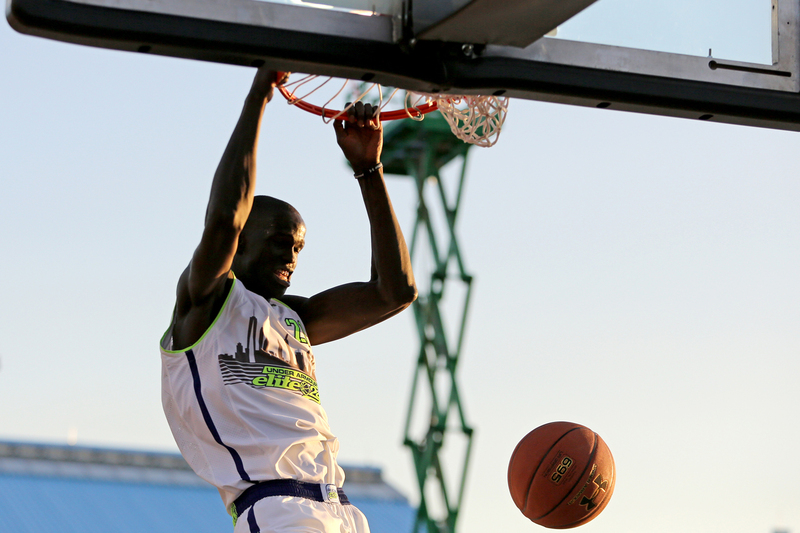 Thon Maker competes in the 3-Point Contest in the Under Armour Elite 24 Skills Competition on Aug. 21, 2015, in Brooklyn, New York. In June, Maker was the MVP of the NBPA Top 100 Camp, finishing second in scoring and first in rebounding while leading his team to the championship. Maker averaged 25 points, 12 rebounds and 4 blocks last season, leading Athlete Institute to its conference championship. Now he’s ready to bring his talents to the NBA. But the scouts gathered at the combine in May were disappointed when Maker opted not to play in the five-on-five games. He did test well, demonstrating good agility in drills and recording a maximum vertical leap (36.5 inches) that surpassed the numbers recorded by Dwight Howard (35.5) and DeAndre Jordan (30.5). But can the kid play? And is he worthy of a first-round pick? An Eastern Conference scout searching for answers while watching Maker’s recent workouts in New York came away with just as many questions. “He’d definitely filled out a lot since I’d last seen him, and his workouts demonstrate his obvious talents as being very athletic,” the scout told The Undefeated. “He can shoot an NBA three in a workout with no one on him, but can you do that in a five-on-five setting? Is he worth a first-round selection? Maker has heard all the questions. But during interviews and workouts, he’s held his head high and grown more confident. Earlier this month, the YouTube star on the verge of an NBA contract was asked after a workout with the Celtics what he’s learned about himself in the weeks leading up to the draft. Today, we’ll learn just how much the NBA agrees.